If this card is Summoned: Target 1 face-up card on the field that you can place a Spell Counter on; place 1 Spell Counter on that target. If this card is destroyed by battle: You can Special Summon 1 Level 2 or lower Spellcaster-Type monster from your Deck in face-down Defense Position. 3 Apprentice Magician seems to be related to the Dark Magician in some way. Seeing that the monster is wearing the Magician's attire - or it might be that the monster itself can be seen as a far younger version of the Dark Magician. 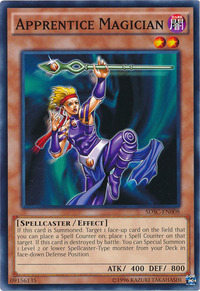 This card seems to be polar opposites of Frequency Magician (which can be searched out and summoned by this card): This card is DARK while Frequency Magician is LIGHT, they have reversed ATK and DEF of each other, and this card gives other cards a Spell Counter when summoned while Frequency Magician gives itself a Spell Counter when summoned. If "Pitch-Black Power Stone" is negated by "Royal Decree", then "Pitch-Black Power Stone" will remain on the field meaninglessly. When "Royal Decree" is removed from the field, the effect of "Pitch-Black Power Stone" is reapplied, so you can put Spell Counters on "Pitch-Black Power Stone" by "Apprentice Magician: If "Pitch-Black Power Stone" is negated by the effect of "Royal Decree", are Spell Counters placed? If you Special Summon "Apprentice Magician" face-down (such as with "Apprentice Magician’s” effect) then you do not place a Spell Counter. “Apprentice Magician’s” effect activates at the same time as when monsters are sent to the Graveyard. But it does not have to be sent to the Graveyard; you get to Special Summon a new monster when "Apprentice Magician" is destroyed as a result of battle, even if "Banisher of the Light" is in play. If you take control of your opponent's "Apprentice Magician", and it is destroyed as a result of battle, then your opponent (the original owner) will get to Special Summon. Because “Apprentice Magician” is no longer on your side of the field, it is now in the opponent’s Graveyard (or removed from play area). You must show your opponent the monster you Special Summon. For effects that place a Spell Counter, you can chain to the activation of those effects. The Spell Counter is actually placed when the effect resolves. Dark Valkyria: While "Dark Valkyria" is an Effect Monster, you can place Spell Counters onto it with other card effects, like "Apprentice Magician." Pitch-Black Power Stone: "Pitch-Black Power Stone" may itself receive additional Spell Counters from effects such as "Apprentice Magician". Tower of Babel: You can move Spell Counters to "Tower of Babel" with "Pitch-Black Power Stone", but if the 4th Spell Counter is placed on "Tower of Babel" with"Apprentice Magician", "Tower of Babel" is destroyed but no damage is inflicted. Storm Caller: If a Psychic-Type monster destroys your opponent's "Apprentice Magician" by battle, if you return it to the top of your opponent's Deck its effect does not activate.